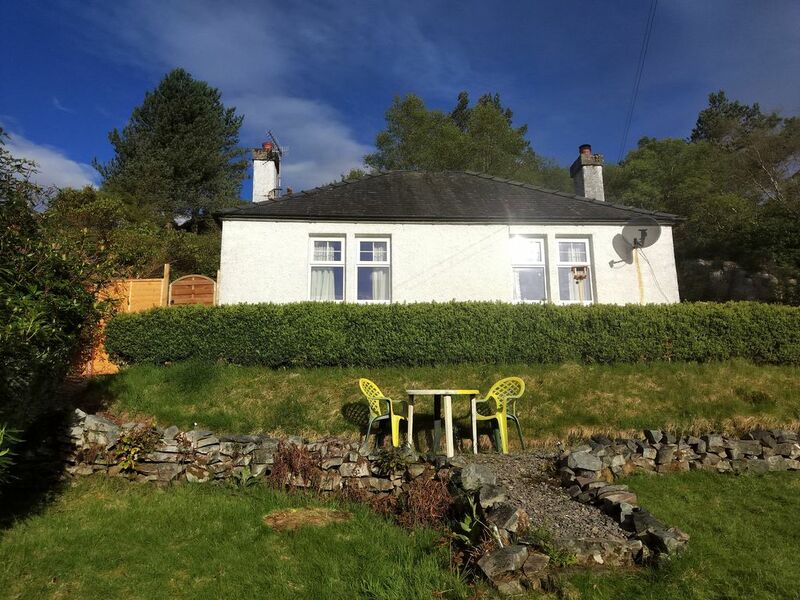 Secluded cottage very close to Skye Bridge and within Kyle of Lochalsh village. A secluded 2 bedroom cottage just off Kyle of Lochalsh main street. It is also a 5 minute drive to the famous Skye Bridge so is a terrific base from which to explore the beautiful island of Skye. There are signposted walks to the Plock View point starting outside the garden gate. From the Plock, about 10 minutes walk there is a 360 degree view of the surrounding area including the lochs and over towards Skye and the other islands of the Inner Sound. There are several attractions within Kyle of Lochalsh such as the Glass Bottom boat tours, seal boat tours and a Railway Museum. Further away with short drives are the picturesque villages of Plockton with its wonderful Plockton Shores restaurant and Plockton Inn and Plockton Hotel restaurants. (Plockton is accessible by train from Kyle). Near Plockton is Craig Highland Farm with a large variety of rare farm breeds and other creatures. The nearby village of Kyleakin in Skye also has a picturesque harbour and sign posted walks to Castle Moil. On the mainland the world famous Eilan Donan Castle is near Kyle and a stop for a walk in Lochalsh Woodland Gardens Gardens on the way to Eilan Donan is well worth a visit. There are several great walks in the area by sea lochs and land lochs. Detailed descriptions of these walks can be found on Walk Scotland website. And of course, what everyone comes here for, to tour Skye. The cottage is situated very near to the Skye bridge. So Portree is under an hours drive away and in the other direction a scenic road trip down the southern point of Skye at Armadle where the ferry crosses to Mallaig is also about an hours drive. And trips to the Quiraing, Fairy Pools, Old Man of Stour, AROS Centre or Dunvegan Castle are also convenient from Kyle. There are bus services to Portree from Kyle. At the cottage, with the tall rhododendron trees the front garden can be an excellent wind sheltered and privately discrete sun trap for sunbathing in sunny afternoons. There is an grassed area at the side of the house ringed by stone and with an interesting rock face that is ideal for BBQs and also has a fire pit. The cottage has an open fire, which has an ash pit beneath so is easy to set as the ash pit bucket only needs emptying after about 5 days to a week. Small bags of coal can be purchased at the Coop supermarket if an evening by the fire is wanted. If you have a dog, there is good dog walking from outside the gate up to the Plock view points or from actually within the garden to just follow the path along through the trees quite a distance or go further and follow the path down to the rocky coves, such as the old Fisherman's Bay. We are David & Yvonne. We purchased this 1938 Cottage in 2017 as a place to live while working on ships in Kyle of Lochalsh. During this time we renovated the cottage and have been running it as a B & B using Airbnb, where we have good reviews. Due to moving away again for work we are now using the cottage for holiday lets in this excellent gateway to a wide variety of tourist attractions. The location of the cottage makes it a terrific hub for day tours around the area and of course Skye. Portree is less than an hour's drive. Secluded and private yet situated within minutes walk to normal town amenities, as well of course the views and tourist attractions. toilet, shower, Open plan in bedroom but toilet is in privacy alcove. Telephone is VOIP through a mobile network. It will accept incoming calls. Requires pre-paid credit for outgoing calls. Mobile phone networks can be poor inside but often works near front windows. Modern heat pump condensing tumble drier. Open hearth fire in living room. Fire has an ashpit, so most days any ash can just be raked into pit below grate and fire reset. Ash pit bucket only needs emptied after around 5 days of fires. Parking area outside garden gate. WiFi from mobile network router. Living room has 3 seat leather sofa and 1 leather armchair as well as 4 place dining table and chairs. Fridge / Freezer unit although freezer compartment is quite small. In electric cooker, also a grill. Pots & pans, usual kitchen utensils. Toaster, kettle, cafitiere, various bowls, oven tins, electric hand mixer & blender. Preparation utensils and knives, cutlery and crockery. KItchen has most usual household appliances and utensils. 4 Ring electric cooker with grill and oven. There is a kettle, toaster, electric hand blender and electric hand mixer. Dining table for 4 in living room. Secluded garden to front, surrounded by tall rhodenedron trees. It is very sheltered from breeze and can be a quite hot sun trap in the afternoons for relaxing and sunbathing. Kayaking center at Broadford approx 12 miles away. If you have your own Kayak / Canoe there are plenty places to launch nearby. Boat and seal tours available from Kyle and Kyleakin, including Glass bottom boat. No Veranda or balcony but plenty seating areas outside, on the terraces in front of the house, in the garden or in the BBQ circle. Small terraced area above the front garden. Can be good for sunny breakfasts & lunches outside. There is a public leisure pool within 100 yards, complete with Spa Bath, Fitness Suite and Sauna. The cottage location of close proximity to Skye bridge makes it ideal as a base for exploring the length and breadth of Skye. It is also close to Eilan Donan Castle and the picturesque village of Plockton with its good restaurants, including our favourite the Plockton Shores.